Universities must act decisively when disaster strikes. By their very nature, modern universities are welcoming, open environments that are typically spread across many buildings, often in an urban setting where they are seamlessly integrated into the surrounding cityscape. They’re also bustling places where a wide mix of young adults crowd around every available space and move about freely, often with pack-sacks, handbags and smartphones in tow. But their size and location, together with that hall-mark diversity and freedom of movement, also make universities unique in regards to the security and protection of the thousands of people who go there to work, study, visit and live. “Universities are not like a vertical office tower or an industrial complex that has been designed with security in mind,” says Mark LaLonde, director of risk solutions with Xpera, a Canadian company that provides risk mitigation and threat assessment services, and which counts universities among its clients. In addition to having a multitude of windows and doors, most of which don’t lock from the inside, Mr. LaLonde says university campuses are also notoriously difficult to navigate, particularly for vehicles. They also rely on small unarmed security forces to monitor and assist large numbers of faculty, staff and students. Any and all of those particularities come into play when an incident occurs. And the list of potential emergencies is long. As with any large built environment, there is the possibility of power outages, broken water mains and other disruptions, as well as the more serious threats of a lab accident or fire. Any of these may require immediate evacuations and cripple school operations, in whole or in part, for extended periods of time. Universities can also face extreme weather events and, depending on the region where they’re located, earthquakes. In addition, health-related emergencies – like the SARS outbreak in Toronto in 2003 and the Norwalk virus that hit Mount Allison and St. Francis Xavier universities in 2006 – may require a rapid response. Then there are the types of crises that can haunt any emergency planner: physical or sexual assaults, or the ultimate nightmare – a mass shooting. Online threats, like the menacing comments posted on blogs and social media aimed at several Canadian universities in recent months, must be taken seriously and may also cause major disruption – last October, Wilfrid Laurier University’s Waterloo campus went into an hours-long lockdown after threats against the school were posted online. These incidents came in the wake of a campus shooting at an Oregon college that left 10 people dead – the 52nd school shooting up to that point in 2015 in the United States and the 166th since 2013, an average of nearly one a week, according to the organization Everytown for Gun Safety. Though rare in Canada, such deadly incidents have occurred here, most notably at three postsecondary institutions in Montreal: Dawson College in 2006, Concordia University in 1992, and École Polytechnique in 1989. For Canada’s universities, being ready and able to respond to any and all emergency situations is both a top priority and a major challenge. Though no two schools take the exact same approach, all have developed similar structures to govern and guide emergency preparedness. Couched in the broader context of provincial health and safety laws, which require employers to provide and ensure a safe work environment, most universities rely on joint committees that bring together administrators, faculty, students and health and safety officials to set policies and procedures for how to respond. Darren Dumoulin, assistant director of security operations at Concordia University, says all large Canadian universities have detailed emergency management plans that outline the responsibilities for communications and decision-making in the first critical hours of a situation. For the most part, those responsibilities typically lie with well-structured, well-drilled crisis management teams that are strongly linked to the school’s security, communications, human resources and student services departments. “They work mostly in the shadows, but they can come together quickly to manage and control the response,” says Mr. Dumoulin. Concordia’s team, for example, deploys during a prolonged crisis of a day or more in an emergency operations centre that is staffed by a dozen people and commanded by the school’s vice-president of services. Depending on the crisis, the team can also reach out to faculty experts from the university’s wide spectrum of disciplines, from engineering and business management to health and social sciences. At most Canadian universities, crisis communications involves official messages sent out using emergency notification systems. Depending on the school, that may include voice and text messages, RSS feeds and emergency alerts to its websites, office phones, campus computers, university email addresses, over public address systems, to social media sites like Twitter and Facebook, and to mobile devices of people who have signed up to receive them. At the University of the Fraser Valley, only 13 percent of staff and full-time students were signed up to the school’s two-year-old system, dubbed UFV Alert, as of February 2016. “Although this rate of uptake is in line with many postsecondary usage rates, we would like to see more people on the system,” says Dave Pinton, UFV’s director of communications. He hopes publicized tests of the system, like the one held on Oct. 15 as part of an annual province-wide earthquake drill in B.C., will help to raise awareness. “We are marketing the use of UFV Alert and expect growth in registration to continue,” he says. Officials at the University of New Brunswick also hope to see an uptake in sign-ups for the emergency alert messaging software it purchased last year with St. Thomas University, which shares UNB’s Fredericton campus. The software adds phone and text messaging capability and message templates to the school’s emergency alert system, which previously relied on email, social media, traditional media like radio and TV, and word of mouth. 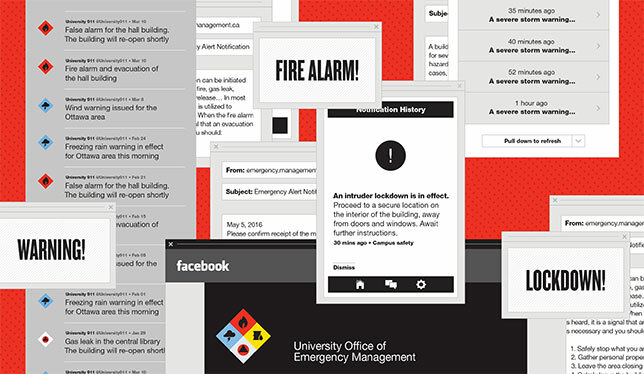 Another emerging tool being used by universities for mass alert notifications is customized apps that staff and students can download to their smartphones and other mobile devices. One example is SAFEHawk, a two-way communication app that was customized for Wilfrid Laurier University. The app enables users to receive alerts about campus safety issues in real time, reach campus and local police services, and report suspicious activities. Similar apps are being used by other universities, such as SAFEGryphon at the University of Guelph and SeQure at Queen’s University. Laurier’s app is also being developed in Mandarin, the most common language among the university’s international students. That’s why the school partnered with a Calgary software company to develop a downloadable mobile app called UC Emergency. Launched last year, the app provides direct messaging to users, can identify and locate users, and notifies first responders, campus security, crisis management personnel and Calgary emergency services. “Most campuses are ideal places for apps because they have great wireless penetration and the population has lots of smartphones,” says Mr. Maber, adding that the response from the U of C community has been positive right from the start. “We exceeded our [previous] voluntary text messaging subscription list in six weeks, and we now have about 15 percent of the university’s population,” he says. The app has proven successful on several occasions, including a lockdown alert at the university’s Foothills campus after a man (who turned out to be part of a military exercise) was seen with a gun. Mount Royal held a three-day mock disaster in January organized by a private emergency preparedness company. The drill tested the school’s response to, among other things, a simulated on-campus arson incident. Last year, the university’s physical resources team installed “grab-and-go” manuals (which indicate muster points and actions to take in specific emergency situations) in special cabinets located in classrooms, offices and other high-traffic areas. It also worked with other postsecondary institutions through the Campus Alberta Risk and Assessment Committee to produce a nine-minute video, entitled Shooter on Campus: Know You Can Survive. The video counsels students on the three actions to take in such horrific situations: get out, hide or fight.